Digital technology is revolutionizing the healthcare sector. The global digital health market was valued at approximately US$ 122.66 billion in 2017.1 Only investment in digital health startups2 reached US$ 11.78 billion globally in 2017 alone3, with 852 deals in total. Healthcare companies around the world are now taking advantage of these exciting changes to create value for patients, clinicians and shareholders alike. From the widespread adoption of digital platforms connecting customers to practitioners to the vast potential of artificial intelligence (AI), digital technology is increasingly core to the future growth of medical technology firms all around the world. While this digital revolution is taking place on a global scale, Asia’s underlying key structural and demographic needs and home-grown tech industries pose a unique opportunity for digital healthcare firms. Asia’s aging population creates a higher disease burden in communities, and the urgency of meeting that burden will only continue to rise. This burden is exacerbated by underdeveloped healthcare infrastructure and clinical talent shortages, especially in China’s lower-tier cities. Despite the challenges, Asia also provides a strong foundation for further digital growth. The growth of the internet and mobile-based technology has been encouraged with regulatory support from governments, and in China a legal framework is open to leveraging population scale data if for public benefits. There is also in China a menu of critical enablers that can underpin the coming revolution, including an openness to what might be termed “Agile innovation” (aka China pace), global centers of excellence in digital technologies such as AI and blockchain, and ready access to investment capital. Much has been written globally and in recent years about the use of digital technology to support management of patients and interactions with them; in China, it’s BAT (Baidu, Alibaba, Tencent) consumer ecosystems, and an app culture (e.g., apps for recording sleep quality and heart condition, hospital registrations, and medical fee payments). Fewer column inches have been devoted to how the digital revolution will be delivered in the highly regulated world of medical devices and equipment, and the impact of that. This Executive Insights seeks to redress that deficit and expand on how medtech companies — both in China and beyond — are seizing the initiative, and how medtech leaders can think about identifying opportunities in their own businesses. In order to better understand how digitization is changing the medtech landscape, we will be taking a look at how other companies have entered the medtech space. These companies have made varying degrees of progress in their digital journeys; most are established medtech industry participants. Even with the wide disparity in offerings and experience, digital technology is providing new tools to add to an ever-changing healthcare landscape. We will be looking at this digital revolution through the lens of a three-pronged framework, representing the different paths that companies have taken to add digital technology to their healthcare portfolios (see Figure 1). While there has been a large focus on patient-facing aspects of digitalization, digitalization is also a powerful tool to reduce costs and time on the back-end, resulting in improved levels of service and increased profits from efficiency gains in R&D through supply chain management, sales and marketing. Channel management. As far back as 2010, leading medical device company Medtronic launched an online B2B platform to more efficiently manage 500+ distributors in China. The new digital system covers the full cycle of distributor services, including order placement, tracking, sales data declarations, inventory management and accounts receivable. Medtronic continues to introduce new features into the system annually, leveraging new technology to streamline operations according to the needs of the local market. Equipment service. In 2017, Roche Diagnostics in China began to remotely monitor and manage in vitro diagnostic medical devices (IVD) that it has in the field. Using the data returning from the instruments, Roche can optimize device availability with predictive maintenance, and tailor recommendations for a suitable IVD product based on customer needs. Clinical trial delivery. In 2017, GE Healthcare developed a digital biomarker application to measure physiological, cognitive, and behavioral characteristics of patients in clinical trials for treatments for Alzheimer’s disease. Frequently generated patient data allows pharma companies to optimize study recruitment, enabling more consistent and accurate predictions of study outcomes. The app is designed to help better select suitable patients for trials, reducing time and cost. Beginning with a focus on the boundaries of existing core products, companies can improve their offerings through high-impact digital strategies that can range from soft-touch development of existing products to innovative and groundbreaking new technologies. Electronic health record sharing solution. GE Healthcare and Trice Imaging, a company that specializes in cloud medical imaging, partnered to develop an integrated cloud-based platform for clinicians to connect with their colleagues and patients, particularly to share EHRs. The solution will support diagnostic collaboration, remote viewing, and archiving of data, allowing critical information to be shared with the necessary interest groups. Remote patient monitoring. In 2016, Philips launched a telehealth service for home-based patients via a cloud platform for tracking and health monitoring in Singapore. With this product, patients are able to input daily activities and data into the system, and will receive a call from a Philips consultant should any results be alarming. It also allows healthcare providers to share data with each other for consultations, saving time by connecting providers into a single integrated system. Diagnostic imaging and triage. Colorectal, gastric and esophageal cancers are major killers in China, and incidence rates are still on the rise. The traditional method of screening and diagnosis is by endoscopic inspection, requiring an extended one-to-one consultation between the patient and one of only 29,000 qualified endoscopy doctors in China. However, with 120 million people needing endoscopies each year, 50 times as many qualified endoscopy doctors are needed. Tencent is developing an endoscopy solution — Miying — with Sun Yat-sen University Cancer Treatment Center that is able to rapidly analyze endoscopic images for signs of cancer at an unprecedented pace. Chronic disease management. In 2017, Emperra GmbH developed the world’s first smart insulin pen, ESYSTA, that transfers and records doses dispensed to the mechanism’s internal platform using industrial, scientific and medical (ISM) wireless technology. Data that is collected is processed and analyzed by Emperra, and is then released to physicians and healthcare providers to improve treatment and patient management. Surgical planning. Bencin Studios, a leading U.S.-based gaming and production studio, is developing an imaging application for Microsoft Hololens.4 The app, called “RadHA,” develops 3-D radiology images and projects them on a real-world background. These images enable radiologists to visualize and study different parts of organs, projected in distinct colors. Through the use of augmented reality, medical experts are able to examine biological nuances in greater depth and with higher accuracy. Some companies are finding inspiration in “digital native” business models and new technologies from outside the healthcare arena to provide a foundation for disruptive digital strategies that have the potential to revolutionize conventional market needs and behavior. 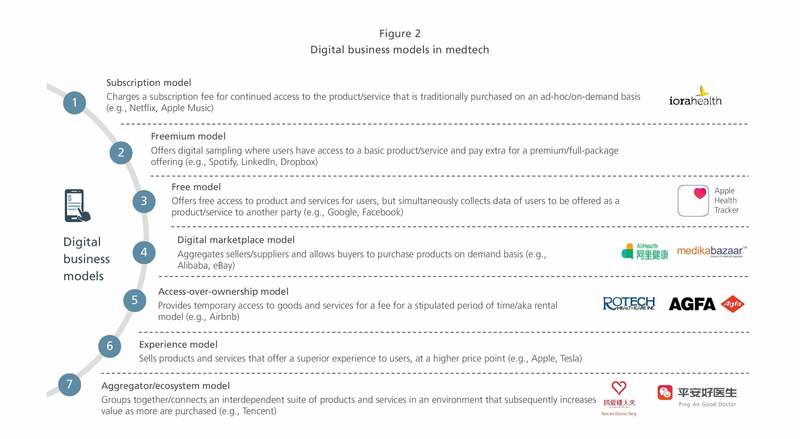 Example: Digital business models in medtech. Digital business models are being adapted to fit the healthcare mold. Innovative healthcare companies are drawing parallels with leading technology firms in relation to their business models. 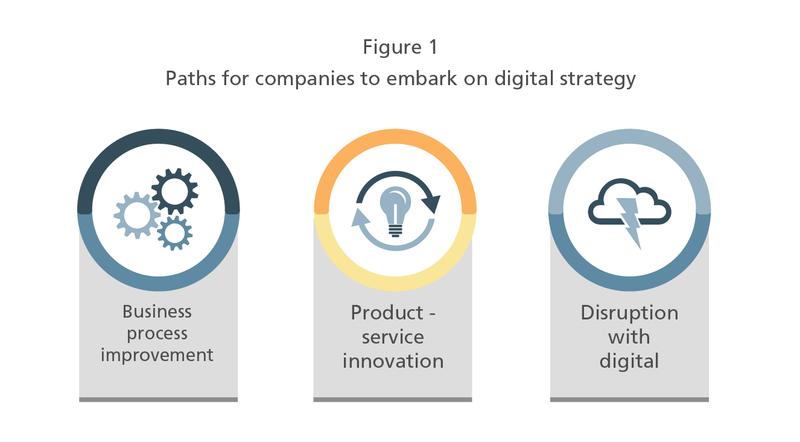 By following companies such as Google, Netflix and Airbnb, among others, these companies are able to leverage digitization and stay relevant within the healthcare sector (see Figure 2). Example: Blockchain in the supply chain. Technology leader IBM and Chinese conglomerate Sichuan Hejia have collaborated to launch a supply chain financial services platform for pharmaceutical procurement using blockchain technology. The highly secure tracking system will enable small and medium-sized pharmaceutical retailers to have increased credit ratings for bank loans, which otherwise suffer under the strain of delayed payments from hospitals. This partnership gives way to a secure and reliable method of process tracking, which promotes transparency as well as a creation of trust along the supply chain. Medtech companies are now positioned to profit from significant opportunities in digitalization, particularly in Asia where conditions are ripe for rapid digitalization to take place. There is a strong technical and financing ecosystem for digitalizing medtech in China. However, as with broader medtech, the local priorities from digital innovation are somewhat different from major developed healthcare markets. Leaders in China’s medtech companies should develop a framework for digital innovation in order to challenge themselves and their teams on how digital technologies can be used across their existing business operations, products and services, and their business models to deliver value for patients, clinicians and owners. Most medtech companies today rate themselves as relatively weak on the cross-functional collaboration and technical capabilities needed to deliver progress on their digital agenda. Breaking through will require strong executive leadership, and often outside partnerships for a start. More structurally, digital leaders can explore inorganic options (e.g., M&A, partnership, licensing) to quickly fill product and capability gaps. Where is my organization on its own digital journey? What are the value-maximizing digital opportunities in my firm right now? Are they global or local in nature? What capabilities are needed to deliver on our opportunities in the near term and long term? What is the gap? What are the right choices for partnerships to fill gaps? What is the appropriate pace at which to invest in building capabilities, next-generation propositions and business models? 1Digital Health Market[R]. Zion Market Research, 2017-2024, July 2018. 2Startups here include companies that have raised seed rounds, series A/B/C/D rounds, accelerator rounds or other growth equity rounds. 4Microsoft Hololens is the first self-contained holographic computer.